Improved productivity requires accurate identification of pests in potatoes and also in the cabbage rotation crop. As well as helping Indonesian farmers, this information will assist Western Australian seed potato exporters understand the challenges their Indonesian customers face. 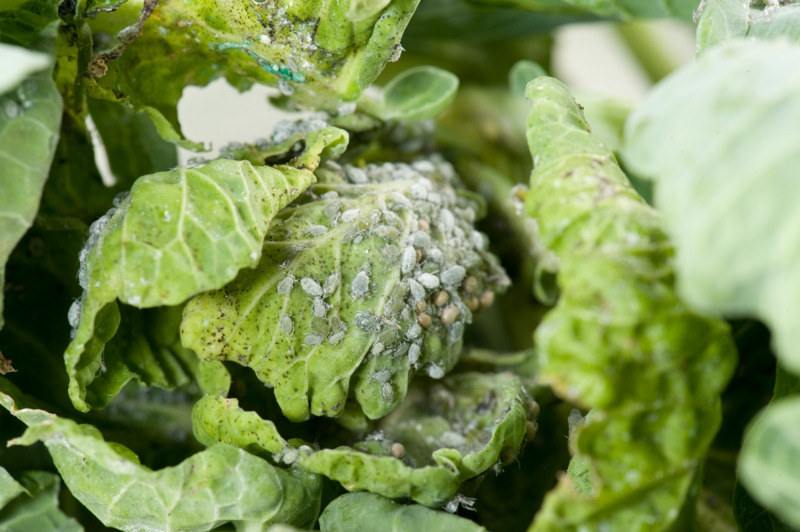 Three main species of aphids attack cabbages and other brassica vegetable crops. The Indonesian name for all three species is "kutu daun" and the scientific names are Brevicoryne brassicae (cabbage aphid), Lipaphis pseudobrassicae (turnip aphid) and Myzus persicae (green peach aphid). Cabbage and turnip aphids are the main species that attack cabbages. Green peach aphid can also attack cabbages, mainly in the early growth stages. Information on green peach aphid as a pest of potatoes is available. The aphids are 1.5 to 2.5mm long with two tubes called cornicles on the end of the body. Use a 10x hand magnifier to be able to positively identify an insect as an aphid. Adult aphids can be winged or wingless. Winged adults invade crops and produce live nymphs which grow to become wingless adults. When populations on leaves are high, nymphs become winged adults. Cabbage aphids are greyish to mid-green and covered with a white wax. If they are parasitised by a wasp, their bodies become brown as the wasp larva grows inside the aphid body killing it. These aphid shells expand and are called 'mummies'. The wasp adult chews a circular hole through the aphid skin to emerge. Turnip aphids are yellowish to olive green and have little or no wax covering. Green peach aphid winged adults have black patches. Nymphs or wingless adults can be yellow or green to pale brown.